Week 4 with Jamie – Chicken…. I have driven my husband mad this week! You see our group chose Chicken Parmigiana and carrots in a bag to cook this week. I was keen to cook the carrots in a bag but Chicken Parmigiana…… you had to be kidding….ewww!!! I struggled all week with it. I came to the conclusion I’m not such a great ‘team’ player…… I like things to go my way!! My concern was ‘why on earth would we be cooking a fatty pub meal?’. Andrew kept telling me that I was just being silly and everything would be fine. So I went to class this week not really excited about the whole idea of cooking the dreaded Chicken Parmigiana! Well…… I have to apologize for all my complaining (my poor dear lovely husband….sorry xoxo). 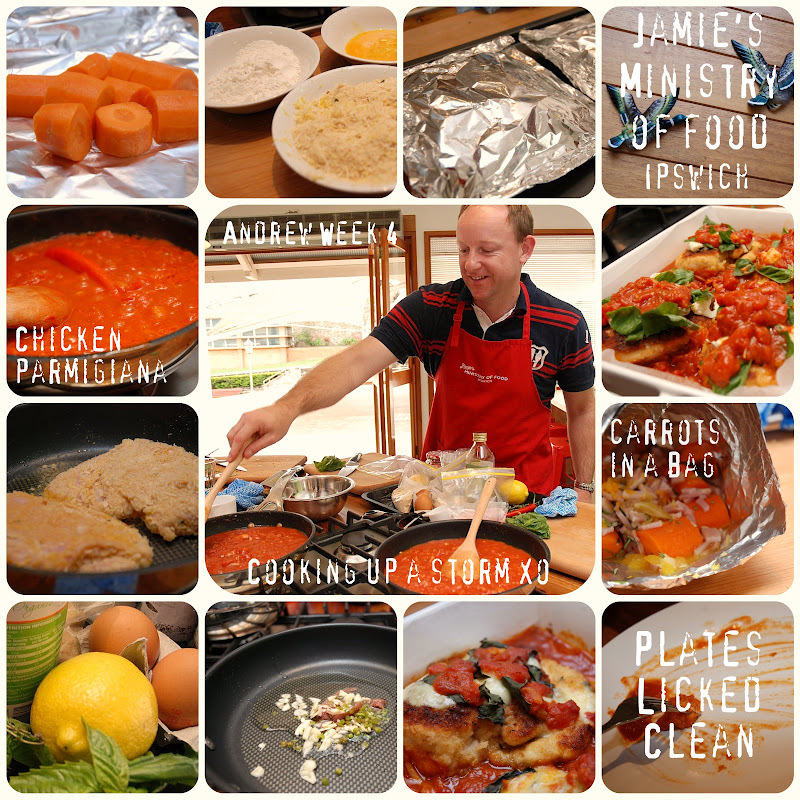 Jamie’s Chicken Parmigiana was indeed fabulous! A healthy extra tasty version of the fatty pub classic! And the carrots in a bag…..oh I wish you could have smelt it – carrots, bacon, rosemary, orange zest = mmmmm YUM! My parents joined us for dinner to share in our genius cooking. There was not a scrap of anything left on the plates…..licked clean (well not literally)! I have learnt a few valuable lessons this week (that I already knew anyway). Jamie always puts an extraordinary twist on recipes and ‘oh Belinda…stop all the carrying on and just enjoy yourself!!’. Next week – Chilli Con Carne, guacamole and fluffy rice….no complaining here!! Author BelindaPosted on May 22, 2011 May 23, 2011 Categories Family, ProjectsTags carrots in a bag, Chicken, Ipswich, Jamie's ministy of food, Week 44 Comments on Week 4 with Jamie – Chicken….